Paired up next to your bed, our Crossan Night Stand will offer a touch of rustic charm and natural hardwood beauty that will make the perfect statement in your bedroom suite. With a large opening and a fully extending dove-tailed bottom drawer, you can be sure to have ample room for all of your bedside essentials, right where you need them. 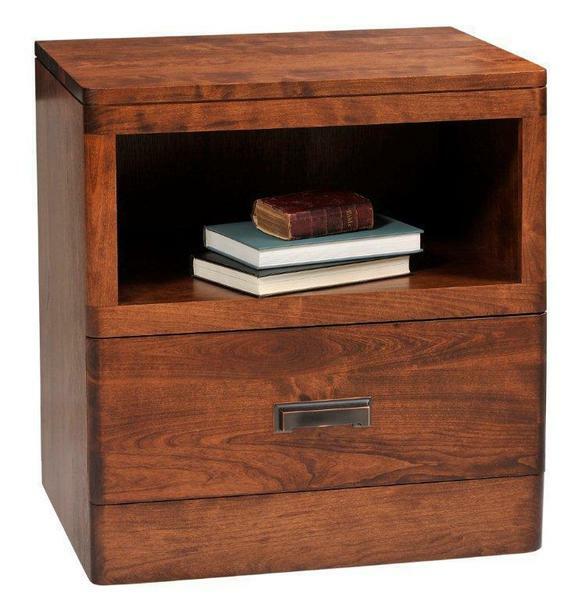 Our Crossan Nightstand is bench-built by highly skilled Amish woodworkers, right in Ohio, using old-world techniques that have been handed down for generations. The result is a magnificent example of the heirloom quality and natural beauty of American Made Furniture - ensuring in a piece that can be handed down for generations! We offer our Miller Bedroom Collection in an array of hardwood and finish combinations that will help you create the bedroom of your dreams! Call us today to request stain samples and speak with one of our Amish Furniture Specialists to start your order by phone. Toll-Free (866) 272-6773.